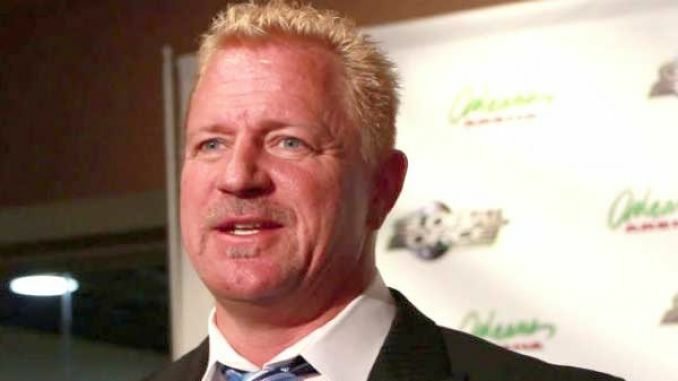 Jeff Jarrett has returned home after completing a WWE-sponsored rehab program, Eddie Edwards drops GHC title to Kenoh, WWE stock drops after Alpha Entertainment news & more from John Pollock. **The WWE crew is gearing up for one of the busiest weeks of the year. The company will be holding back-to-back television tapings at the Allstate Arena in Chicago for Raw on Monday and SmackDown Live on Tuesday. The Raw crew will have a Tuesday night live event at Madison Square Garden with John Cena on the road for the company and facing Roman Reigns at The Garden. **After posting their lowest number ever on POP TV last week, a taped “Best of 2017” edition of the show shot back up with 269,000 viewers this past Thursday. The number is the highest Impact number since November 16th. While last week’s number was faced with the extra competition of the WWE’s “Tribute to the Troops” event, this week had the added benefit of no NFL game going up against it. Impact Wrestling will now have the luxury of no more NFL competition on Thursday nights until the next season. Impact continues with another “Best of 2017” episode this week and will return with a new episode on Thursday, January 4th. **Brock Lesnar is scheduled to appear on three episodes of Raw leading up to the Royal Rumble. Lesnar’s next appearance will be on New Year’s Day in Miami, followed by appearances on January 8th in Memphis and the big 25th Anniversary edition of Raw on January 22nd in Brooklyn. It was officially announced this past week that Lesnar will defend the Universal championship against Braun Strowman and Kane in a triple threat match at the Royal Rumble on January 28th in Philadelphia. **Jeff Jarrett has returned home after going through a WWE-sponsored rehab program. Jarrett had several public incidents over the past year where he appeared to be performing while under the influence. Jarrett was initially suspended indefinitely by Impact Wrestling back in September and outright fired in October. Jarrett’s firing from Impact Wrestling led to the company distancing themselves from the Global Force Wrestling branding and back to Impact Wrestling. **Eddie Edwards’ run as GHC heavyweight champion came to an end on Friday’s Pro Wrestling NOAH card at Korakuen Hall. Edwards dropped the title to 32-year old Kenoh (Daisuke Nakae). Kenoh is a former GHC tag & junior heavyweight tag champion and was the winner of this past year’s Global League tournament, where he defeated Go Shiosaki in the final. The Korakuen Hall event was promoted around the retirement of The Great Kabuki. **Ed Leslie a.k.a. Brutus “The Barber” Beefcake has just released his biography, which was co-written by Kenny Casanova. The 400-page book covers Leslie’s upbringing in Tampa, breaking into the industry and his runs with the World Wrestling Federation and World Championship Wrestling under dozens of different aliases. The book is not currently available on Kindle but they are expecting to have it available on the device within a month through Amazon. **The WWE stock closed at $29.55 on Friday following the news on Thursday of Vince McMahon’s stock sale. The number is still at a very healthy price but will be monitored more closely over the next announcement as more is discovered about Alpha Entertainment and its plans. On the surface, it isn’t a WWE funded company but the resource stockholders are going to be concerned with is McMahon himself and what portion of his time will be dedicated to an outside venture and away from the core business.